The agency, employing between 1,500 and 2,000 people worldwide, has its headquarters in Vienna (Austria), with 21 field offices and two liaison offices in Brussels and in New York City. The United Nations Secretary-General appoints the agency's Executive Director. 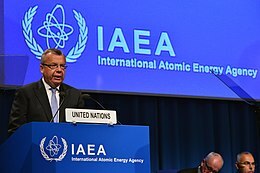 Yuri Fedotov, the former Russian Ambassador to the United Kingdom, has held this position since his appointment in 2010, when he succeeded Antonio Maria Costa in his personal capacity, and also as Director-General of the United Nations Office at Vienna. The office aims long-term to better equip governments to handle drug-, crime-, terrorism-, and corruption-related issues, to maximise knowledge on these issues among governmental institutions and agencies, and also to maximise awareness of said matters in public opinion, globally, nationally and at community level. Approximately 90% of the Office's funding comes from voluntary contributions, mainly from governments. Through the World Drug Report, UNODC aims to enhance Member States' understanding of global illicit drug trends and increase their awareness of the need for the more systematic collection and reporting of data relating to illicit drugs. The Protocol to Prevent, Suppress and Punish Trafficking in Persons, especially Women and Children aims to provide a convergence in the states' domestic offences in the investigation and the persecution process. Another objective of the protocol is to protect the victims of trafficking in persons with full respect. In its resolution 55/61, the General Assembly recognized that an effective international legal instrument against corruption, independent of the United Nations Convention against Transnational Organized Crime was desirable. The text of the Convention was negotiated during seven sessions held between 21 January 2002 and 1 October 2003. The Convention was adopted by the General Assembly on 31 October 2003. In 2003, the United Nations adopted the UN Convention against Corruption (UNCAC). The Convention came into force in December 2005. As of 9 November 2012, 140 countries had signed and 164 countries (States Parties) had ratified the UNCAC. UNODC serves as the Secretariat for the Conference of the States Parties (CoSP) to the UNCAC. 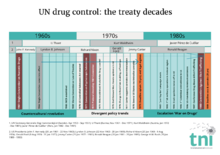 There are three drug related treaties that guide UNODC's drug related programs. These are: The Single Convention on Narcotic Drugs of 1961 as amended by the 1972 Protocol ; the Convention on Psychotropic Substances of 1971 and the United Nations Convention Against Illicit Traffic in Narcotic Drugs and Psychotropic Substances of 1988. UNODC launches campaigns to raise awareness of drugs and crime problems. On 26 June every year, UNODC marks the International Day against Drug Abuse and Illicit Trafficking. On 9 December every year, UNODC commemorates the International Anti-Corruption Day. Because young people are also often more likely to use drugs, The United Nations Office on Drugs and Crime (UNODC) targets this population with a campaign to raise awareness about drug use and its connection to the spread of HIV and AIDS. The slogan: "Think Before You Start ... Before You Shoot ... Before You Share" is used to provoke young people to consider the implications of using drugs, and particularly injecting drugs. 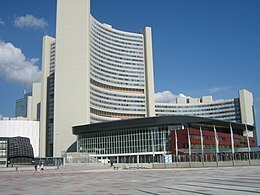 In 2007, the five largest donors to UNODC's budget in descending order were: European Union, Canada, United States, the UN itself, and Sweden. According to the Transnational Institute this explains why, until recently, UNODC did not promote harm reduction policies like needle exchange and Heroin-assisted treatment. (This despite the actions of United Nations bodies (i.e. WHO and UNAIDS), who support these policies.) UNODC promotes other methods for drug use prevention, treatment and care that UNODC sees as "based on scientific evidence and on ethical standards". The UNODC has been criticized by human rights organizations such as Amnesty international for not promoting the inclusion of adherence to international human rights standards within its project in Iran. Amnesty states that in Iran there are "serious concerns regarding unfair trials and executions of those suspected of drug offences in Iran. He then went on to blame the Talmud, a key Jewish religious text, for the expansion of illegal drugs around the world and said that it teaches to "destroy everyone who opposes the Jews." European Union High Representative of the Union for Foreign Affairs and Security Policy Catherine Ashton called his remarks "unacceptable" and reaffirmed the European Union's "absolute commitment to combating racism and anti-Semitism." Ashton went on to say that "the High Representative is deeply disturbed by racist and anti-Semitic statements made by Iranian First Vice President Mohammed Reza Rahimi at the U.N. International Day against Drug Abuse". The UN Secretary-General Ban Ki-moon issued a statement saying that he had "...on many occasions called on Iranian officials to refrain from these kinds of anti-Semitic statements...[and] believes it is the responsibility of leaders to promote harmony and understanding and he deeply regrets expressions of hatred and religious intolerance." The Minister for Middle East in the UK Alastair Burt said "We condemn utterly the baseless comments from Iran's Vice-President Rahimi about the Talmud and the Jewish faith, made at a United Nations drugs control event in Tehran this week. Racism and anti-semitism are unacceptable in any circumstance, let alone at an event sponsored by the United Nations. We call upon Iran to correct this scandalous statement, and to ensure that its officials respect the proper international norms and standards in the future." Israeli Foreign Minister Avigdor Lieberman said that "Israel would not allow any Jew to be harmed." ^ "UNDG Members". UNDG. Archived from the original on May 11, 2011. ^ United Nations Secretariat Secretary-General's Bulletin Organization of the United Nations Office on Drugs and Crime ST/SGB/2004/6 page 1. 15 March 2004. Retrieved 2007-11-16. ^ "About Us". United Nations Office on Drugs and Crime. UNODC. 2014. Retrieved 2014-10-28. The Terrorism Prevention Branch (TPB) of the United Nations Office on Drugs and Crime (UNODC) is the key United Nations entity with the mandate and expertise to deliver counter-terrorism legal technical assistance to Member States for the ratification, legislative incorporation and implementation of the international legal instruments against terrorism. [...] Since 2003, the Branch administers the Global Project on Strengthening the Legal Regime against Terrorism which provides the operational framework for UNODC's specialized legal and capacity building assistance related to terrorism. ^ "World Drug Report - Global Illicit Drug Trends". UNODC. ^ "United Nations Convention against Transnational Organized Crime and the Protocols Thereto,2000". UNODC. ^ "Single Convention on Narcotic Drugs, 1961" (PDF). INCB. Archived from the original (PDF) on 2012-01-31. ^ "Convention on Psychotropic Substances, 1971" (PDF). INCB. ^ "United Nations Convention Against Illicit Traffic in Narcotic Drugs and Psychotropic Substances, 1988" (PDF). UNODC. ^ "About the World Drug Campaign". UNODC. ^ "ACT Against Corruption: About the Campaign". UNODC. ^ "What is Think AIDS?". UNODC. ^ "What is the Blue Heart Campaign?". UNODC. ^ "Svensk bedömning av multilaterala organisationer - FN:s organ mot brott och narkotika, UNODC" [Swedish assessment of multilateral organizations - United Nations Office on Drugs and Crime, UNODC] (PDF) (in Swedish). Ministry of Foreign Affairs Sweden. 2008. p. 2. Archived from the original (PDF) on 2011-06-12. ^ "The United Nations and Harm Reduction Overview and Links". TNI. ^ "Drug use prevention, treatment and care". UNODC. ^ "Addicted to death: Executions for drug offenses in Iran" (PDF). Amnesty International. 2011. ^ "International Anti-Corruption Day: recognizing excellence in combatting corruption". www.unodc.org. Retrieved 2019-02-16. ^ "Attorney General of Qatar reappointed as UNODC advocate for anti-corruption in MENA region". www.unodc.org. Retrieved 2019-02-16. ^ Hamel, Ian (2018-02-26). "Le Monsieur Anticorruption du Qatar et son hôtel particulier". Le Point (in French). Retrieved 2019-02-16. ^ "Scenesetter for Visit of Deputy Attorney General Mark Filip to Qatar". 15 October 2008. ^ "Role in Qaeda operatives' release returns to haunt Qatar Attorney General". english.alarabiya.net. Retrieved 2019-02-16. ^ Qatar, Observateur Indépendant Du. "Le procureur du Qatar Ali Bin Fetais Al-Marri a-t-il aidé des membres d'Al-Qaida?". Mediapart (in French). Retrieved 2019-02-16. ^ Miles, Hugh (2012-11-29). "Qatar poet receives life sentence". Retrieved 2019-02-16. Organization of the United Nations Office on Drugs and Crime, Secretary-General's bulletin, ST/SGB/2004/6, 15 March 2004.